SKU: chocMELTER (20kg) Art.-Nr. 19-111-000. Availability: 5 in stock Size: 64 × 34 × 30 cm Shipping Weight: 12 kg Category: Food. 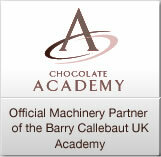 Gentle, fast control of your melting chocolate by special tempering and warming! The chocMELTER warming tank has been designed specifically to heat and maintain melting chocolate at a temperature range of 20°C – 60°C / 68°F – 140°F. The system works with direct and air based induction heating, applied from below as well as each of the four sides. This innovative approach heats the chocolate much faster and more efficiently than the industry standard ‘below only’ heating systems – which take many hours longer to melt the chocolate. With the combination of a quality control system and temperature sensor being located ‘in the chocolate’, (rather than just the air void below), you can be sure of far more accurate readings. The heating unit will click off after achieving the desired temperature. If the vat is left within the chocMELTER with the lid on, retained heat is excellent. The efficient, low energy design translates into significant running cost savings. In addition to the energy saving, faster heating and accurate control, this SWISS made product has been developed with a compact & lightweight footprint and comes with ergonomic easy to carry handles & horizontal control panel. The unit is also designed with maximum hygiene in mind – the electrical components are damp washable with no indents and the body does not have the gaps or screw holes that are present in most warming tanks. The chocMELTER has been designed specifically for heating chocolate and cocoa butter, however, dependent upon the required temperatures, it can potentially be used for similar materials such as icing, glaze, butter and the like. We’ve also designed our 6 kg chocMELTER. This chocolate melter is the smallest of our range of professional chocolate melters and is ideal for small production units and a perfect complement of the equipment portfolio of pastry chefs and chocolate artisans. In summary, what makes it far more attractive than competitor products? Innovation.